FILE - Togo's Faure Gnassingbe speaks to media in Lome, Togo, April 25, 2015. Togo's opposition parties pledged Wednesday to maintain the momentum of anti-government protests, as thousands took to the streets once more ahead of promised talks with the president. The leader of the National Alliance for Change (ANC), Jean-Pierre Fabre, led the crowds in the capital but similar protests were banned on security grounds in the north. "Mobilization will continue, even during talks. We are not going to give up the fight," Fabre told AFP. A source in Togo's second-largest city of Sokode — the stronghold of Tikpi Atchadam, the Panafrican National Party leader behind the demonstrations — said the streets were calm. Many young people who had fled into the countryside fearing repercussions have not yet returned home, the source said, adding that sporadic arrests were still occurring. Wednesday's march was the first of three planned for this week to put pressure on Togo's President Faure Gnassingbe to resign. Gnassingbe has been president of the West African nation since 2005, taking over after the death of his father, General Gnassingbe Eyadema, who ruled Togo for 38 years. Fourteen opposition parties want two-term limits for presidents which would be applied retroactively to prevent Gnassingbe from contesting the 2020 and 2025 elections. At least 16 people have been killed in three months of protests after opposition supporters clashed with police and security forces, especially in the north. Gnassingbe — who left for an Africa-Europe summit in Ivory Coast on Wednesday morning — said last week that preparations were being made for talks with the opposition in the coming weeks. 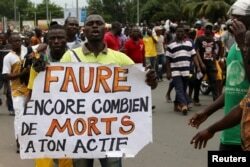 FILE - A man holds up a sign, which reads: "Faure still how many death by you," during an opposition protest calling for the immediate resignation of President Faure Gnassingbe in Lome, Togo, Sept. 6, 2017. But demonstrators said they wanted the issue addressed at the summit. "I would like the heads of state and France in particular to get involved personally and speak face-to-face with Faure Gnassingbe," said Abla, a student in Lome. No meeting has been scheduled so far between Gnassingbe and President Emmanuel Macron, from Togo's former colonial power, France. Franck Paris, a spokesman for Macron's office, said last week that "Togo will be an important subject of talks on the ground." Macron, in an interview Wednesday with France 24 television and Radio France Internationale (RFI), said he hoped Togo's citizens "could express themselves freely." "I hope there can be an electoral process ... which allows either a democratic confirmation or transition of power," Macron said. "Keeping power for a long period of time without any electoral processes, without a framework of pluralism, is not a good thing."